For our next concert, we welcome guest artist Sarah Mead, lyra viol specialist, visiting from the US. We’re performing some sumptuous works from 17th century England when the lyra viol was at the height of its popularity. 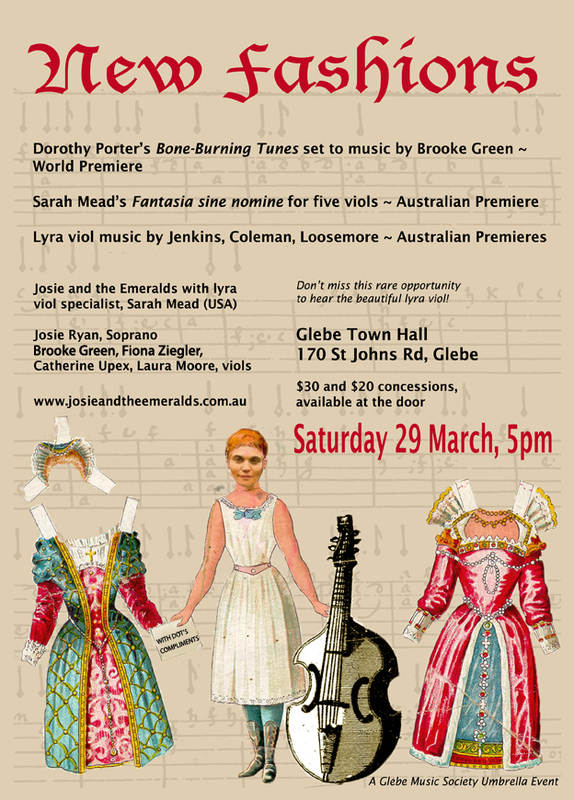 Our contemporary music includes Sarah Mead Fantasia sine nomine for 5 viols (Australian premiere) and Brooke Green’s Shades of Presence Past for Viol Quartet. We celebrate one of Australia’s most brilliant poets: Dorothy Porter with the premiere of her Bone-Burning Tunes set to music by Brooke Green.